The Regius Professorship of Medicine at Oxford was founded by Henry VIII in about 1546. For the sake of completeness, all 29 Regius Professors of Medicine from 1546 to the present day are listed below. Most Regius Professors already have a full entry in the Oxford Dictionary of National Biography (ODNB) and/or Wikipedia, so no biographies for them are provided on this site. There are, however, eleven regius professors – from Anthony Aylworth (1582–-97) to William Vivian (1772–1801) – who have no proper online biography elsewhere, and so they are each linked to a brief biography on this site. 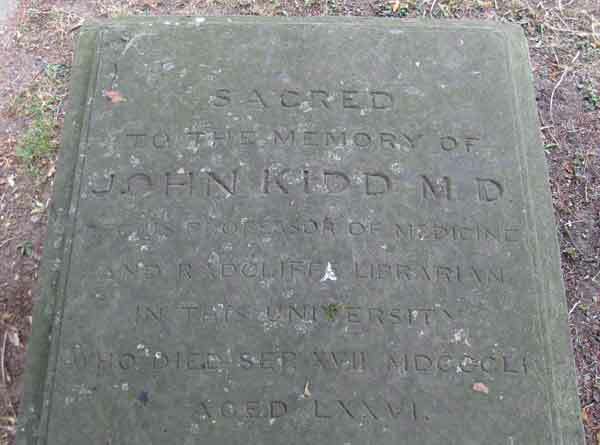 Above: grave of John Kidd in St Giles’ churchyard.